If you are a daily commuter, you often see billboards on the side of the road advertising various movies, TV shows, and products, but you may not think anything of them because there are so many billboards scattered along the freeway. On the flipside, have you ever seen a car driving next to you that is wrapped in creatively colored decals or a fun design? It’s hard not to notice since a majority of cars on the road have no special decals or paint jobs. The car catches your eye easily, and you to read the text on the car out of curiosity or to get more information. Like we mentioned before, vehicle wraps are an effective form of advertising because they stand out in a crowd of cars due to their colorfulness and eye-catching designs. According to the Outdoor Advertising Association of America (OAAA), car wraps offer the lowest cost-per-impression of any form of advertising. They also reported that a single vehicle wrap can generate between 30,000 and 70,000 daily impressions. In addition, you can add any details to your vehicle that you want. Basic designs start with just contact information but can also include focus on a particular product or service, or even creatively using your vehicle as a piece of artwork for branding and name recognition. Car wraps can last between 5-10 years depending on how often the car is exposed to the sun and harsh weather. That’s a good investment considering that car wraps are cost effective and you can quickly get your money’s worth. Imagine how that will extend the paint life of your vehicle too (see point 5)! As the saying goes “The more you put into it, the more you get out of it.” The more cars you wrap and drive, the more exposure and attention your business gets. The OAAA has found that more than 95 percent of Americans are reached by media targeting vehicle drivers and passengers. The same applies to big-rig trucks, which are even better since trucks have more surface area to place bigger and more detailed advertisements. If people see your name and trucks everywhere, they will begin to see you as a big name in your industry and keep you top of mind. One of the best features of a car wrap is that it’s not permanent on the car. You can get old wraps taken off and place new ones in whenever you want. This comes in handy for businesses that promote products by season. Vehicle wraps not only look good, but they can also add a layer of film protection to your car. In addition, wraps do a terrific job of protecting your car’s paint underneath it. When a wrap is removed, the paint is not damaged or harmed in the process. Looking to add a vehicle wrap for your car or fleet? 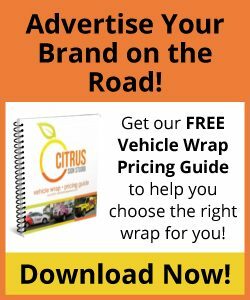 Citrus Sign Studio has you covered, contact your favorite Orlando sign company for a free quote and to learn more about vehicle wraps.